The findings of a major in-depth study of Community trademarks and Benelux trademarks reveals a strong link between trademarks and innovation, with trademarks forming part of a well-trodden path to bringing new products and services to market. Jeffrey L Heninger, attorney-adviser at NASA HQ in Washington DC, gives an insight into his “dream job” and the challenges of working for a government agency. Brand owners targeted by trademark squatters, but with no previous history of conducting business in China can face an uphill struggle when proving prior rights in the country. Could copyright be the answer? As the Uniform Rapid Suspension (URS) celebrates its first birthday, an analysis of the 100-plus cases decided so far reveals some interesting trends, as well as some pointers for where the URS is best suited and where other routes might produce a better result. The next edition of the WTR 1000, released in January 2015, comprehensively identifies the world’s leading trademark firms and practitioners. In this preview, we exclusively reveal those firms which have achieved a listing in more than one region, as well as those which are home to the largest numbers of independently recommended practitioners. Strategically evaluating infringements: cease and desist or cease insisting? ‘Enforce it or lose it’ is the maxim that runs through most brand protection strategies – but is it the smartest way to proceed, or even legally necessary? Learning to live with a little unauthorised use could yield surprising results for brand owners. China has now established a regulatory framework for franchising and lifted many of the restrictions on foreign investment. However, franchisors seeking to enter the market still face several challenges when it comes to building their brands in China. Rights holders are increasingly using design registrations to protect their logos, especially since the most recent Locarno Classification confirmed this practice. But what benefits can this offer brand owners and what pitfalls must they avoid? Arbitration and mediation – a missed opportunity? Arbitration and mediation are under-used when it comes to trademark disputes. However, they can be an excellent way to resolve international conflicts, offering resolutions that will remain confidential via quick and flexible procedures. 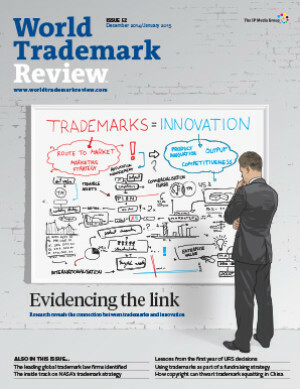 Trademarks are often deemed indefinite simply because they can be continually renewed. However, almost no asset is imperishable and the indefinite life assumption has serious consequences for the values ascribed to trademarks. After years of economic downturn, investors are recovering their appetite and intellectual property can prove key. A management team that understands the importance of its brand and how this can be leveraged is likely to bolster any pitch for investment. Apple retail format – groundbreaking or just another trademark? The European Court of Justice has found that Apple’s representation of the layout of a retail store can potentially be registered as a trademark. While the media has labelled the case ‘groundbreaking’, does it really offer anything new? Trademark-related quotes, opinions and observations from around the globe. Are there too many IP associations? Spreading a pro-IP message and engaging in community education and outreach are positive activities, but could more be done if IP associations united as a single voice? A new Supreme People’s Court ruling offers a much broader interpretation of the term ‘interested party’ and could allow more parties related to trademark owners to bring cancellation actions. What China’s new IP courts will mean. The effects on brand owners of the amendments to the Trademarks Act in Bill C-31 will be wide ranging and varied, but the expanded definition of ‘trademark’ should prove a boon. In Poland, rights holders can draw on a range of legal protection for the overall appearance of or impression created by products. Only trade dress which is distinctive, non-functional and associated with a well-known commodity can be protected under the Unfair Competition Law. Rights holders may obtain the strongest protection for their trade dress by combining the applicable existing legal forms of intellectual property according to the particular needs of the product. The importance of trade dress has been reinforced by judicial precedents which have made clear that products are purchased by reference not just to brand names, but also to their overall presentation.